On January 11, 2017, The Organic Trade Association (OTA) announced a new partnership with the U.S. Department of Agriculture to help guide farmers transitioning into certified organic agricultural production. A significant limit to the continued growth and sustainability of the U.S. organic industry is a gap in domestic supply of organic ingredients and raw products. The growth of organic acreage in the US has never kept pace with demand for organic products and increasing amounts of imports continue to fill the gap. 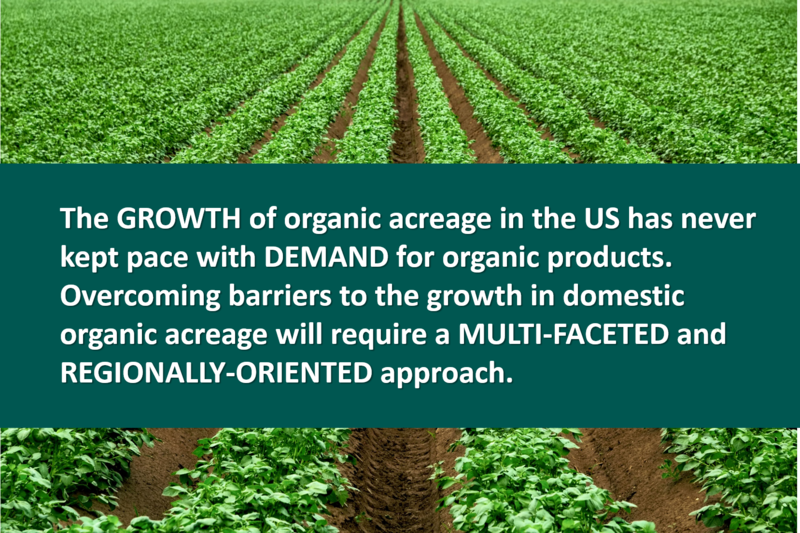 Overcoming barriers to the growth in domestic organic acreage will require a multi-faceted and regionally-oriented approach. Certification of farms in transition for technical support and supply-chain recognition can be a key aspect of encouraging increased domestic organic production. While various certifiers have transitional certification programs, these are not harmonized and lack consistent oversight. OTA has formed a members’ Task Force to explore these issues, and with full support of OTA’s Board of Directors, submitted an application to USDA Agricultural Marketing Service’s Quality Systems Assessment Program to establish a USDA Certified Transitional Program. In 2002, at its spring meeting in Austin, TX, NOSB passed a recommendation (13 – yes, 1 – no) regarding the labeling of transitional products. The recommendation details certain proposed definitions and proper use of the term “transitional” on products grown on farms in transition to organic production. Despite the lack of authority granted through OFPA for NOP to enforce “transitional” labeling claims, it is important for the recommendations of NOSB to be incorporated into efforts to further the organic industry. Since NOP cannot act upon this recommendation, industry initiatives seem most appropriate for the harmonization and recognition of effective “Transitional” labeling mechanisms. A number of Accredited Certifying Agents (ACA) already offer a form of certification to transitioning operations. A recent informal poll of the Accredited Certifiers Association and direct research into services ACAs offer indicate that as many as 15 US-based ACAs offer some form of oversight to transitioning farmers and acreage. ACAs report transitional certification can prevent “surprises” for operations going through the certification process, because the operation has been inspected and audited during each year of its transition. Improved support programs and products from USDA (NRCS, RMA, FSA) – institutionalizing transitional certification could provide better-designed and improved access to USDA support services like conservation incentives, risk management products, and farm loan programs. Better support programs would lead to better success rates and higher performance of transitioned operations. Supply chain management – transparency in future growth of organic acreage can facilitate appropriate business planning and contract development for buyers and producers. Transitional markets – enabling a supply-chain premium for transitional crops can incentivize producers to move towards organic and can reduce the financial burden that a 3-year transition period poses. The effective harmonization of transitional certification programs requires federal oversight of ACAs offering such a program to their clients. Transitional certification of farms and products under USDA’s Certified Transitional Program will utilize the oversight mechanisms provided by USDA’s QSA to harmonize the verification process for transitional operations and provide added assurance that certified transitional operations were truly on their way to sustained organic production. QSA allows for the referencing of existing federal standards, in this case the USDA organic regulations, and audits accredited 3rd party certifiers much like NOP does for ACAs currently. Currently, anyone in the process of transitioning their operation can label their product as “Transitional” without any mandatory oversight by a 3rd party. There is currently no assurance that a crop labeled as “Transitional” in the marketplace is coming from a producer who is actually planning to attain organic status or that the crop has been grown on land free of prohibited substances for at least 1 year. Formalizing transitional certification (e.g., via QSA) and, by extension, transitional labeling will add consistency to any transitional claims or status in the supply chain. In order to minimize the potential for products labeled as “Transitional” to compete with organic offerings, there will be no allowance for the use of a “Transitional” seal on the principle display panel of a transitional product. An ACAs transitional seal may be used under the address of the final handler of the product on the information panel, but that seal must be distinct from the ACAs organic seal. There will be no allowance for the use of the term “organic” to describe a USDA Certified Transitional product. Transitional operations should have a plan for moving their operation towards organic production, and certifiers should ensure these plans are followed and adjusted appropriately. Transitional operations cannot continuously cycle in and out of ‘transitional’ status, and OTA is proposing that a particular piece of land cannot enroll in a transitional certification program more than two times. However, it is important to note that obtaining an official transitional status cannot be a prerequisite for organic certification as OFPA does not stipulate that requirement, and producers should have options as to how they choose to transition their land to organic production. Transitional status should not be granted to any operation until a full year has elapsed since the last application of a prohibited substance on the land. This essentially provides the producer with two crop years of transitional status before entering the organic market. The program should have additional benefits of enhancing access to technical support that improves agronomic, economic, and ecologic system performance on transitioning farms. OTA’s Transitional Certification Task Force recommended moving forward with development of a set of Transitional standards and ACA accreditation quality manual templates for submission to USDA, and OTA’s Board of Directors has approved submission after reviewing a draft. OTA submitted the final standard and quality manual to USDA in May 2016. USDA has confirmed receipt of the submission and intends to roll out the “USDA Certified Transitional Program” later in the year. OTA welcomes input on this effort from the broader organic sector. The standards were based on this input from OTA members and the industry at large and includes a mechanism for future revisions. OTA commits to providing education to industry, consumers, and ACAs on the standards and will provide a regular forum for broad organic stakeholder input to suggest future revisions to the USDA Certified Transitional Program standards. For more information or to provide feedback, please contact OTA’s Senior Crops and Livestock Specialist, Nathaniel Lewis.